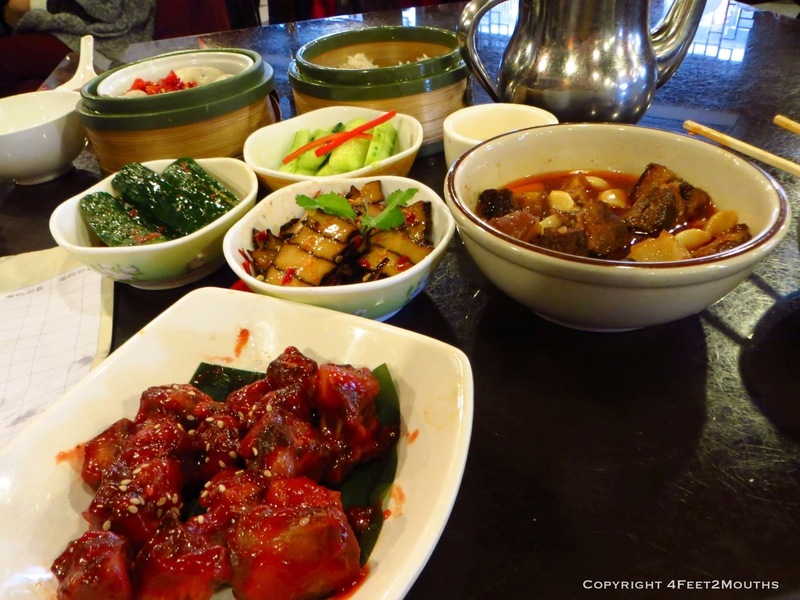 Sometimes people travel to a place for sights, scenery or culture but we visited Changsha for one single reason- food! Changsha is the capital of the Hunan Province and king among one of the most delectable and delicious cuisines. It is also pretty close to the place where Mao was born, but that had little significance to our trip. We reluctantly left the wonderful and clean Hong Kong to explore more of China. We love many aspects of China, we hate many parts too; Hong Kong allowed us to catch our breath, restore our health and ready ourselves for four more weeks of Chinese mayhem. We boarded a high-speed train from Hong Kong to Guangzhou, then a subway subway to the other train station and another high-speed train. Traveling by train at 380kmh (240mph) is wonderful experience. The hillside farms and villages indiscernibly flutter passed and we sit back comfortably and read our books. 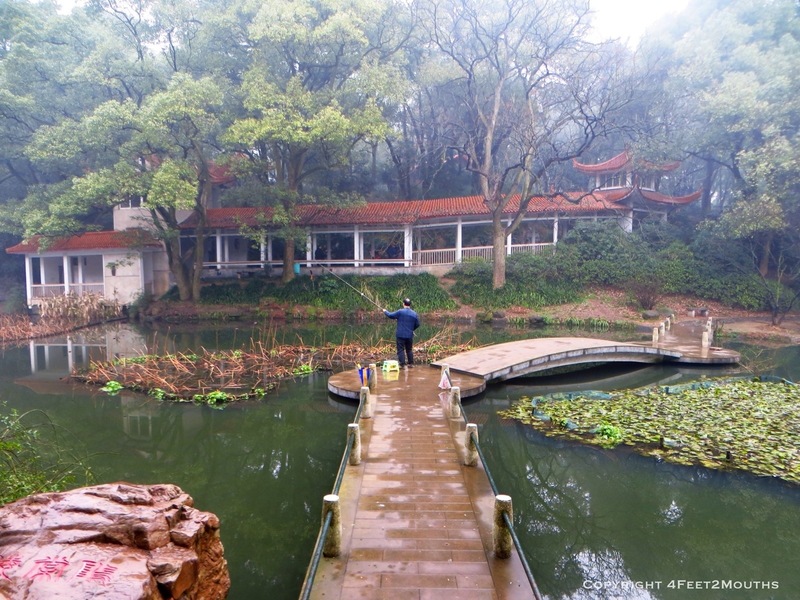 In just a few hours the warm humidity disappeared and we entered the cold landscape of south-central China. We stayed at the one Hosteling International in town. This organization has been failsafe for us to find affordable rooms that are clean. Often there is staff that speaks English and sometimes we’ll opt for the upgrade that has a western toilet :) We roamed the main street for dinner options. It wasn’t late, but 8pm is really pushing it for dinner in China. We walked by an open room that was packed with groups of people sitting at round tables. We squeezed through the chairs, we waved our hands at the sixty people that were now staring at us and we sat next to the wall. The waitress came over with some tea and gave us a crude translation of five dishes on their menu. I opted for the point-and-order-method. I stood up and gestured for the perplexed women to follow me. The table in the corner had some pork belly that looked good. When I pointed at it she waved her hands and gave a cough. I interpreted this to mean that they had ran out (I’m often left guessing in these situations). 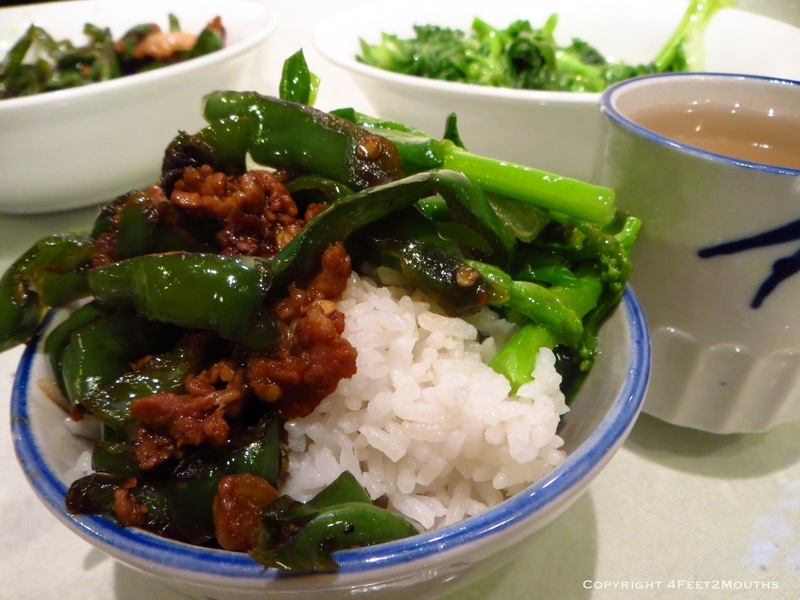 I opted for the sizzling beef and bell pepper dish on that table next to ours and the seasonal greens that another waitress was carrying. I ordered some steamed rice and we were good to go. The restaurant was named Okuwu and it was a delicious find. The vegetables and meat were fantastic; the service was smiling and friendly. We liked it so much that we returned a few nights later for the pork belly. 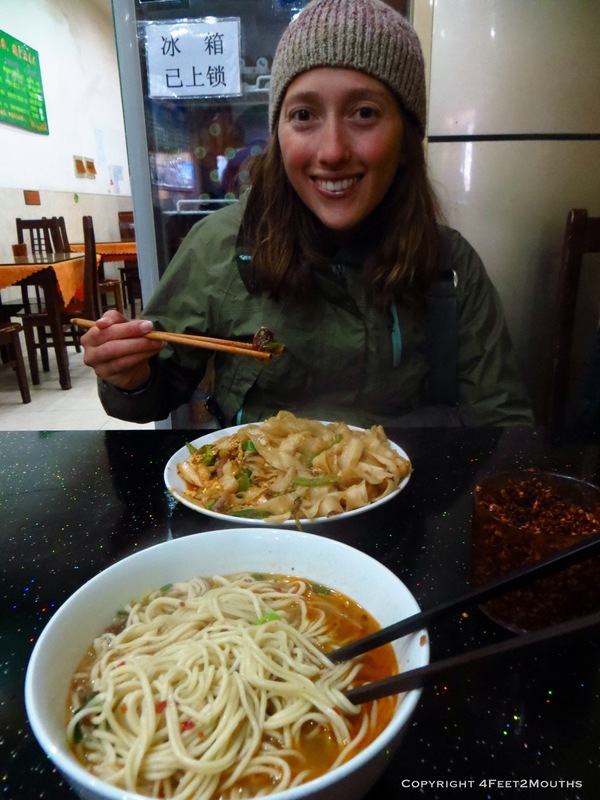 The next few days we decided to take a culinary tour of Hunan cuisine. There was supposed to be this amazing museum with a 2,100 year old mummy that is so well preserved that the skin is still supple. Unfortunately, the museum will be renovated over the next three years. 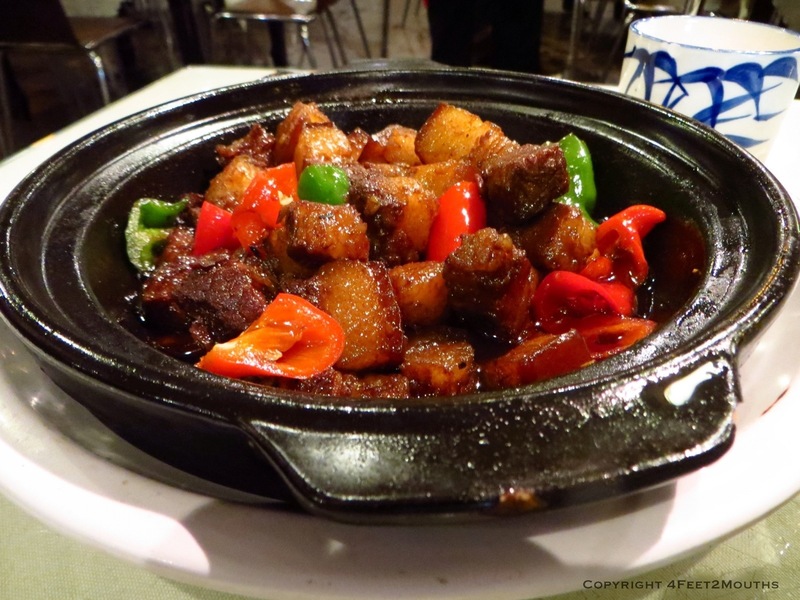 With little to do, our thoughts lingered on finding the best Hunan specialties. There is a pretty famous, and rightly so, restaurant named Huogongdian. They serve tapas-sized portions of local favorites. We selected a handful of specialties from the carts and we had to leaned back in awe when we realized the feast we had just ordered. The prize dish at most Hunan restaurants is the mao shi hong shao riu, a red braised pork belly dish in a spicy broth with onions, dried and fresh peppers. It was supposedly Mao Zedong’s favorite dish and definitely one of mine too. We also ordered chou doufu, a fried tofu dish. 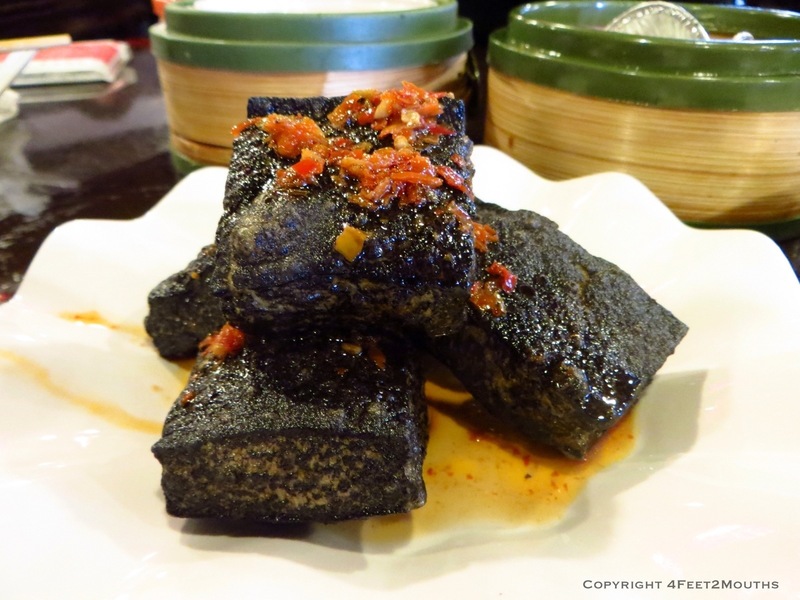 Not ordinary tofu, but tofu that has fermented and molded with a thick fur then deep fried until the mold turns blackish purple. The pungent smell of this dish is distinctly burned and almost sour; the taste is slightly funky and roasted, but not awful. Most blue cheese is way funkier and the Chinese think westerners are crazy for eating that! 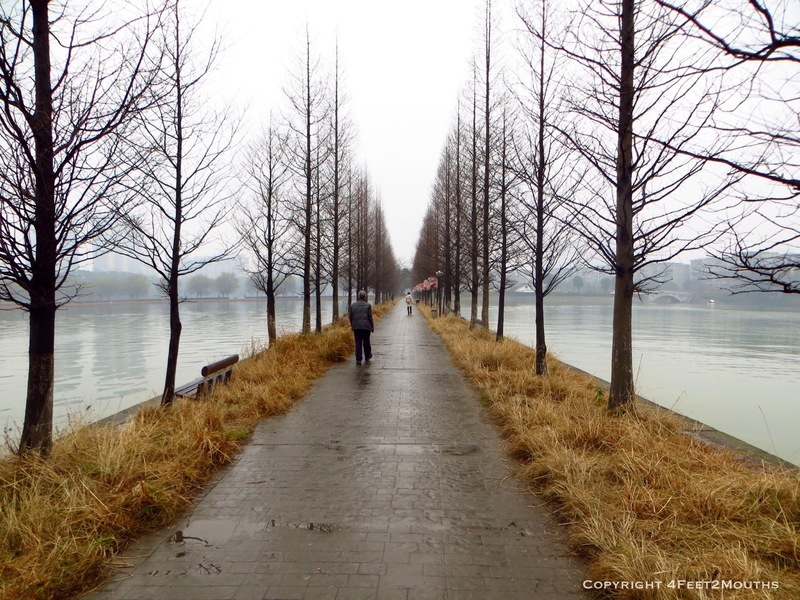 There is a pleasant park in Changsha with a small lake. The park has several rolling hills and plenty of waking paths. We enjoyed watching this fisherman scavenge one of the small ponds for what small carp might be hiding there. 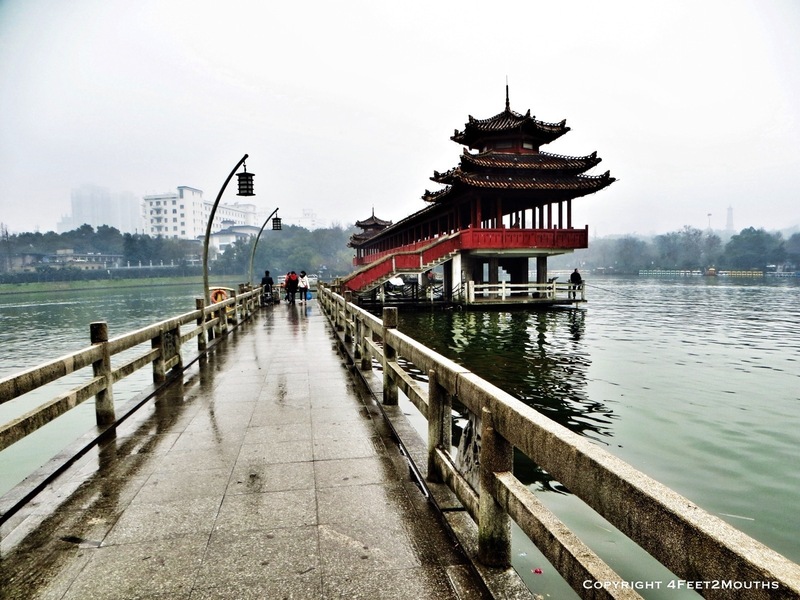 There also was a serpentine set of bridges and pagodas that crossed a narrow section of the lake. We strolled on the paths enjoying the remnants of winter trees and cloud-filled skies. One development from our trip to China has been an intense fascination and interest in western Asia. The constant mix of cultures along the Silk Road has created a wealth of history and a richness of food that we want to explore. We loved Turkey and one of our future trips will need to be to Kirgizstan and Kazakhstan. China has a rather large population of the Muslim Uyghur people. They are a significant minority among the Han and are abundant in every city that falls in line with the historic trade routes of the Silk Road. Changsha was one of these trade cities. The Uyghur people we see are most often street vendors, they wear semi-traditional Muslim clothing and are often very friendly to us. They roast shish kabobs of mutton or goat on long wooden skewers over a coal fire. They fan the coals and season the meat with a sour blend of spices and pepper. 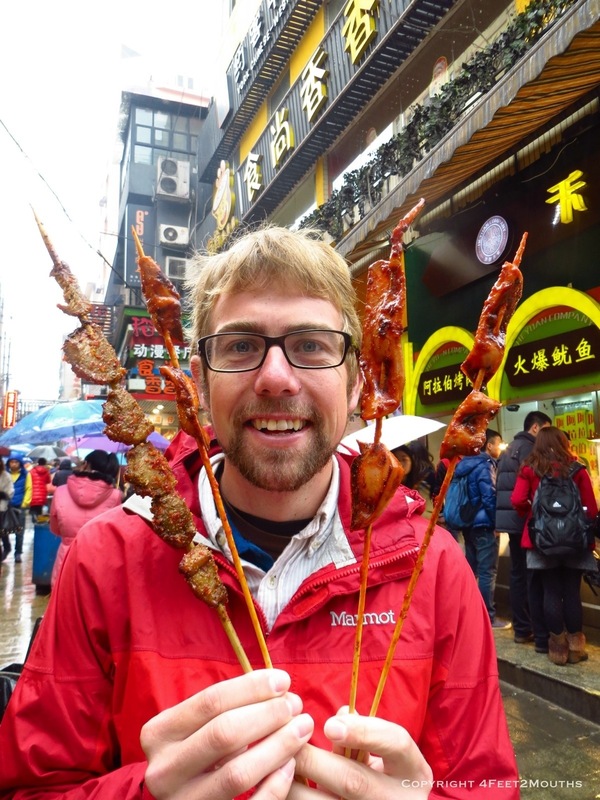 We grabbed five skewers at the park entrance for ¥10 ($1.50) and we continued our walk through Changsha. In the main downtown, there is an open-air hawker center that mostly sells skewered meats and stinky tofu in paper cups. 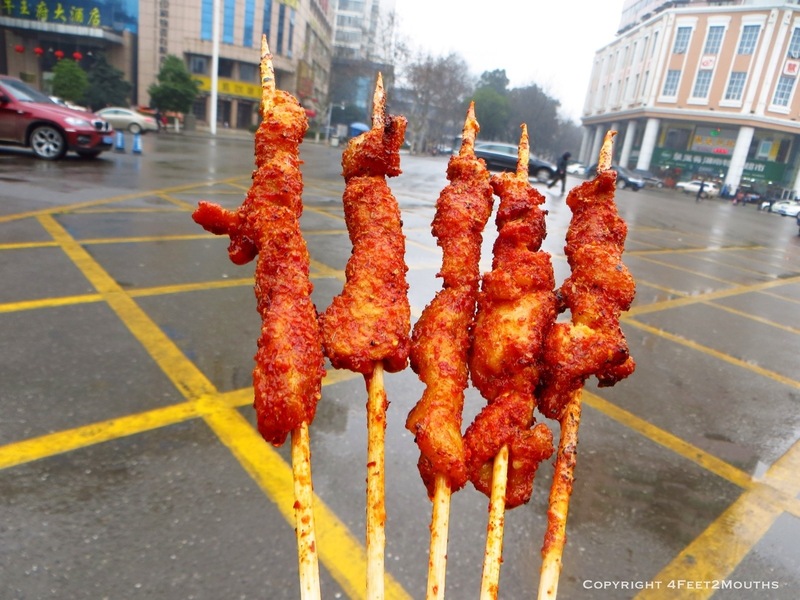 This was a Chinese version of the Uyghur kabobs that uses similar seasoning, but the use othermeats like pork and squid. These were good, but the woman at the park entrance had created something amazing. A few dive restaurants had caught our eye walking around. 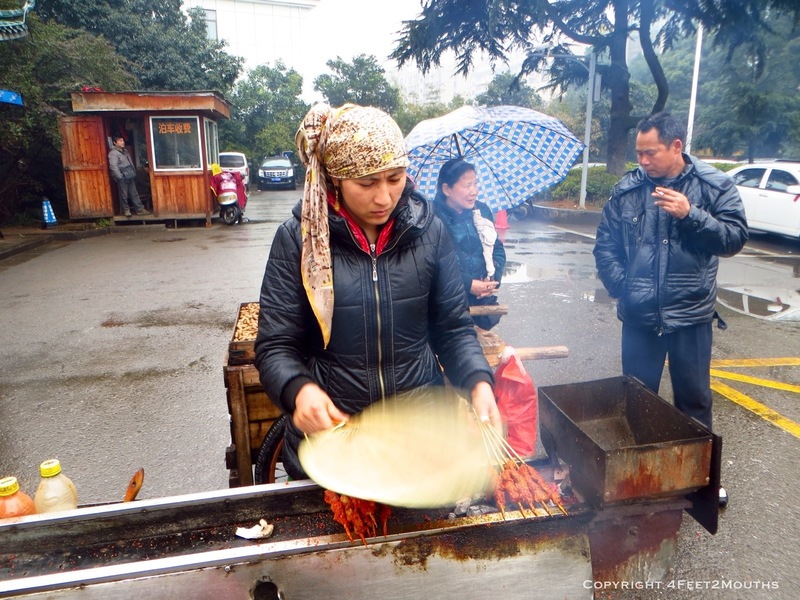 At the front of the restaurant there would be a huge mound of dough sitting on the table and a Uyghur man stretching out huge lengths of noodles. We walked into one of these at lunch time and selected two dishes that we saw other people eating. Mine was a pretty standard beef noodle soup ubiquitous in China, but Carmen had this amazing hand-cut flat noodle with an onion broth poured over the top. 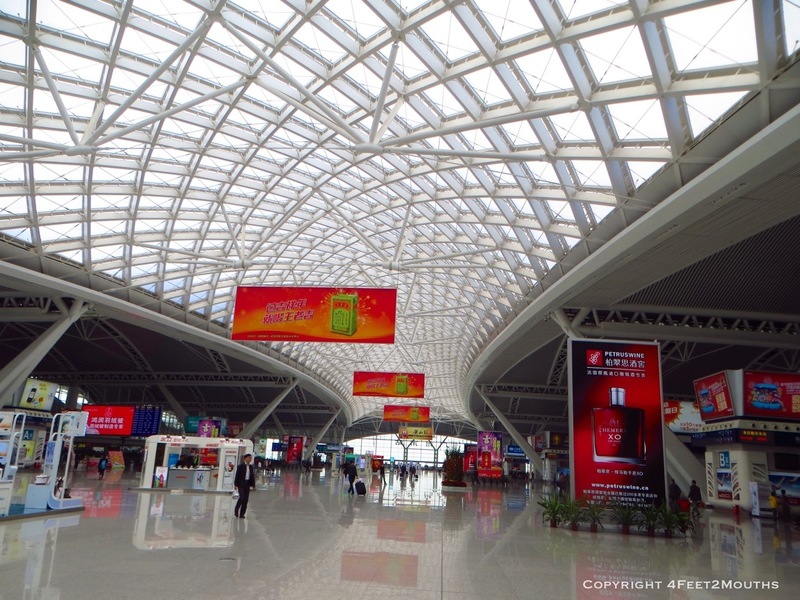 It will be difficult to forget the tastes and variety of food in Changsha. But I will be happy to forget the incessant firecrackers that would go off every morning at 7am. 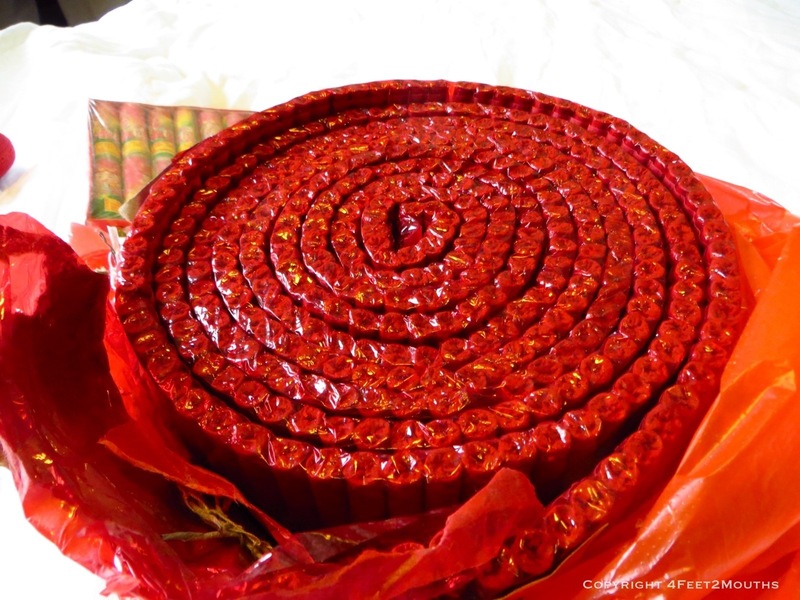 During Chinese New Year, shop owners and families celebrate with reels of firecrackers at all hours of the day. I too am a pyro at heart. Carmen sent me off to go play with the kids down the street. I found three six-year-olds with a lighter more than willing to show me how to light a cracker and throw it in the air. Then I pulled out the 10 inch coffee can sized reel out of a bag. We were all excited; we strung out the fireworks along the playground wall and I lit one end, my friends lit the other. For two to three minutes we watched fireworks explode in the night. The intense sound echoed off the buildings and fiery debris spewed out into the night air. It was so loud and so fun! We were celebrating over a year of travel and welcoming the year of the snake. It will be hard to pull it off, but maybe this year will be better than the last? We’ll at least try. Funky fermented tofu sounds right up my alley!!! Yeah, we’ll have to find some stinky tofu in SF! Ooh the food looks delicious! A amazing assortment of food. Thank you for the photos. I too am a sucker for pork belly, but bulgogi is pretty awesome too. We are super excited to visit Korea. Definitely going on one of our near future trips! For some reason I thought you’d already visited here! But since you haven’t, you’re in for some amazing food when you DO visit. There’s so much variety and eating out is always a communal event in Korea.